Screw pump is a transporting unit and used in waste drilling management, sometimes called augers or auger conveyor. Screw conveyors can also be used to transport cuttings to drying shakers, centrifuges, stabilization systems, and other devices. The main components of screw conveyor are motor, control panel, Screw( including blade and shaft),Conveyor housing, Supporting feet and saddles, Feed and discharge spouts, Cover, Through end, etc. Transportation of heavy solids to various types of processing equipment. Inclined conveyance up to 15°. Integral component in a variety of process and transport systems. 1. Versatility of design enables the operator to install the equipment per specific requirements with less space restrictions. 2. Variable speed drive provides the capability to control the rate the material is being transported, reducing the potential of spills or blockage. 3. Remote and local starter panels enable placement of the starter panel in a location that is most convenient and safe, reducing hazards and increasing the overall efficiency of the equipment. 4. Safety grates and emergency stop devices enhance operational safety. The maintenance-friendly design enables easy access to all mechanical parts, minimizing overall downtime. Generally speaking A screw conveyor or auger conveyor is a mechanism that uses a rotating helical screw blade, to move liquid or granular materials. They are used in many bulk handling industries. Screw conveyor for drilling cutting transfer to feed the Vertical Cutting Dryer or the HI-G Dryer Shakers. 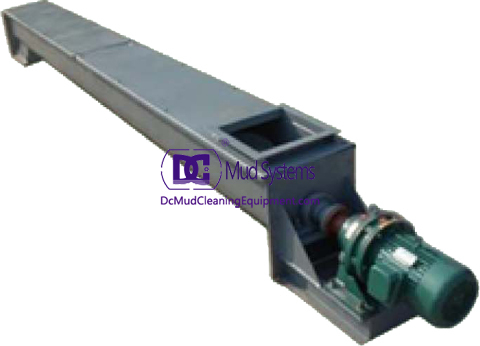 The Screw conveyor allows the drilling waste treatment company to connect the Solids Control System with the drilling waste management equipment. 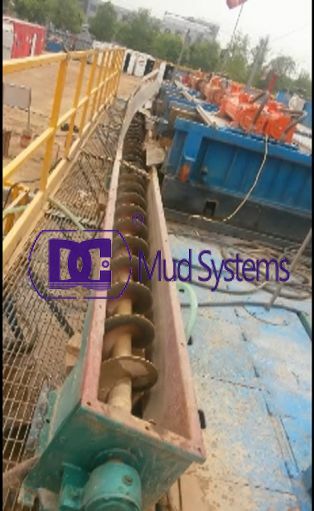 Screw conveyors are typically used to transport drilled cuttings from the shale shaker area to a discharge port, skip or to secondary processing equipment. DC Solid control has standard 14 inch and 18 inch diameter screw conveyor for option, also you can choose 2 section, 3 section, or 4 section ( maximum). Each Screw with electric motor and control panel.